Just when there is a lot of hype about the new Ubuntu 12.04 release, Firefox 12 and Thunderbird 12 are also out, but not yet in the official repositories of Ubuntu, they should be there in the next couple of hours or days, respectively. 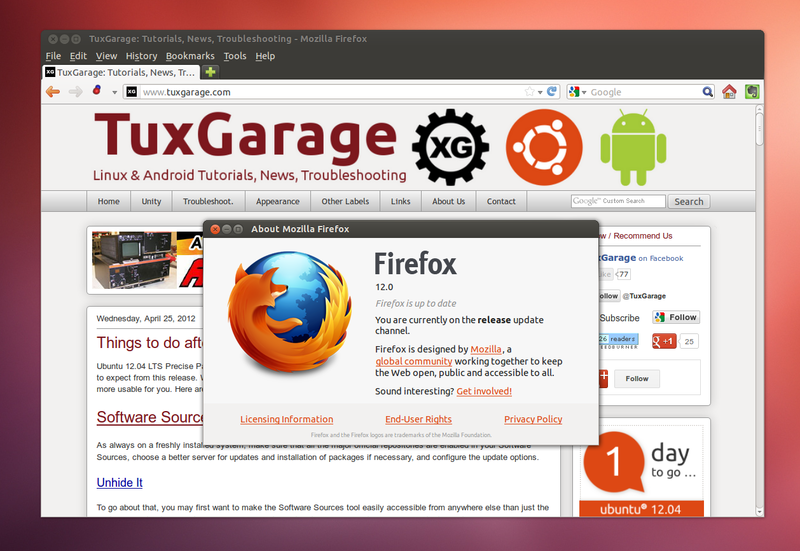 Update 4/26/2012: Except for Precise, Firefox 12 is now available in the official repositories. Update 4/27/2012: Firefox is now available in the official repositories of Precise also. Update 5/5/2012: To our very great surprise, and without any preceding announcement whatsoever, Thunderbird 12 has just been released to the official repositories of all current Ubuntu versions! So at least as of now, you don't need to add the below mentioned Stable PPA to the Software Sources of any Ubuntu version to get the latest Thunderbird version! And that hasn't been updated anyway, now it seems like that was due to the change we have just witnessed. We hope to get an official announcement about that change any time soon, as it would be indeed great if it stayed like this, similar to how Firefox is handled now since some months. Users of Ubuntu Lucid and Natty need to upgrade using the Stable PPA. Thunderbird 12 isn't yet available in that PPA and you might need to wait for a couple of days. You can check that by visiting the PPA's page linked to below. We'll also update this post when the packages are available.